By joining NC TECH you make an investment, not just in your personal and professional growth, but in the growth of your employees, your organization and North Carolina’s tech sector. Our focus is to provide a compelling value proposition to our diverse and growing membership through four key pillars – PROFESSIONAL NETWORKS, GOVERNMENT RELATIONS, TALENT DEVELOPMENT AND SECTOR PROMOTION. As a member of NC TECH, you are a part of a powerful network of 650+ companies, organizations, and institutions made up of 200,000+ employees in NC. No matter your role within the technology ecosystem, NC TECH can deliver value. Whether you develop and sell technology, apply tech within business, consume tech or support tech in government, education and economic development – NC TECH provides a like-minded community for you. We encourage you to join our dynamic community of influencers and innovators advancing the state’s tech future. NC TECH provides members numerous ways to grow their network through peer interaction, educational programming, information share, relationship building and more. NC TECH hosts 50+ gatherings each year across the state, most of which are free for members to participate. Being an active part of NC TECH connects you with those in the business and technology community that help you to continue to grow your business and team. NC TECH offers employment related resources including regional Job Fairs, a tech-focused Job Board, and talent-related data to help members attract and retain top talent. NC TECH offers content rich programming that supports the professional development of employees of member organizations, and initiatives that support Science, Technology, Engineering and Math (STEM) curricula. As the go-to organization for policy makers on issues affecting the tech sector, NC TECH connects members with policy leaders and state government purchasers. Members help develop the public policy agenda, host an annual Tech Day at the Legislature, and participate in sessions with state and federal officials – with our members, NC TECH serves as the voice of the technology sector. NC TECH provides avenues for members to gain recognition through social media, communications, speaking, exhibiting, sponsorship and more. These opportunities help members increase brand awareness and maximize visibility. NC TECH highlights members at events throughout the year including the annual NC Tech Awards which celebrate technology companies, best uses of technology, and leaders. NC TECH convenes members at annual events and Interest and Peer Networks for relationship building and actionable information share. Reports like the annual North Carolina State of Technology Industry Report (www.NCSTIR.com ) grants members access to analytics on IT spend, tech trends, and other industry data. Membership with NC TECH provides access to a wide variety of exclusive savings. All employees of member companies, organizations, and institutions receive free registration to many NC TECH events, as well as partner events. Members can take advantage of resources, special offers, and discounts on products and services through our Business Essentials program and more. Get2Know NC TECH is a monthly interactive webinar that provides an overview of NC TECH activities, online resources and ways to maximize your membership benefits. It is open to all employees of member companies and individuals interested in joining NC TECH. Registrants will receive an email confirmation and call/login information prior to the webinar. Join us for the next webinar: Friday, May 3, 2019 at 9am - view and register at the events calendar. Review the membership categories below to determine which most closely fits your organization. 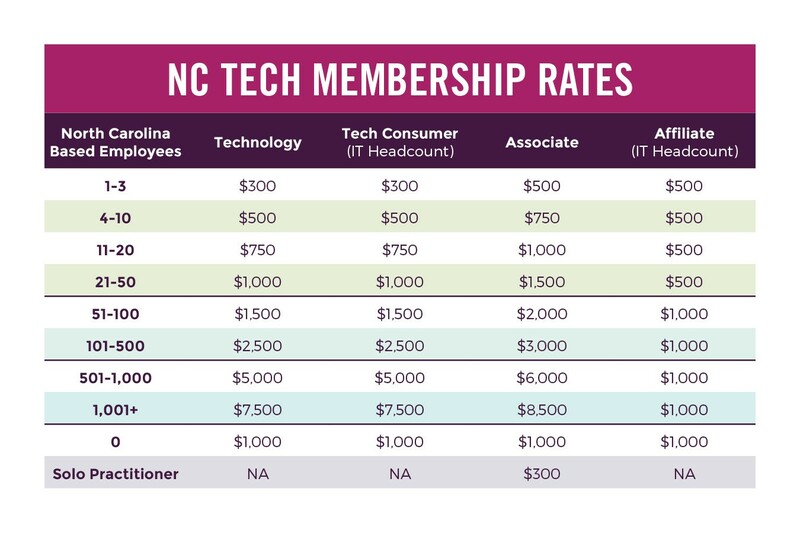 Then reference the membership rate chart to determine annual dues based on your total number of full-time NC employees (or only full-time NC IT employees for Affiliate and Technology Consumers). Your NC TECH membership will be active for 12 months from the time that you join and all employees will have access to membership benefits. For questions regarding your membership category or pricing, contact Emily Young. Please Note: Federal legislation requires NC TECH to notify you in regard to the non-deductible percent of dues paid applied toward lobbying expenses. Our 2019 estimate indicates less than 6.2% of your dues are non-deductible for tax purposes.